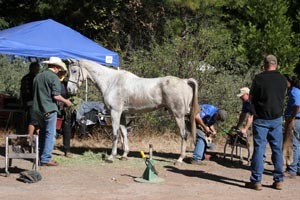 It was a an amazing feat - changing the complete start and approximately first 62 miles of the 2011 Tevis Cup trail because of the early winter snowstorm, with less than 36 hours to go before the start at 6:30 AM on Saturday October 8. Think not only of all the riders that had to be contacted (who were scattered all up and down the I-80 corridor from Winnemucca, Nevada to Sacramento, California, since nobody could get into Robie Park because of snow), but the 700 volunteers, at least 3/4 of whose locations and duties were changed. 179 riders still showed up (only 7 cancelled) and everything ran pretty darn smoothly. Only one person is rumored to have fallen off a cliff, but didn't fall far and was okay (horse was unhurt), and the completion rate was an outstanding 70%. I didn't go out on the trail at all, just caught the start of the ride (see video here, and hung out at Foresthill, which was both the first hour hold and second hour hold, then went back at the finish at Auburn. Story coming, but here are a few photos from the day and the day after. 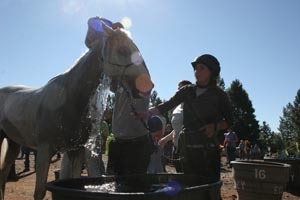 Rachel Shackelford and BR Cody de Soi (2nd place finishers) cooling down at the first Foresthill vet check. 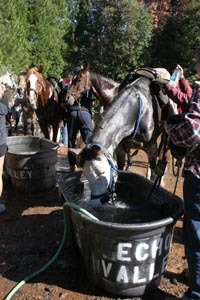 A group of horses and riders come in together to Foresthill and head straight for the water troughs to drink and get cooled down. Bev Gray and Jolly Sickle trotting out at Foresthill. Bev and Jolly won the Big Horn 100 in Wyoming in July, and were second in the 100-mile AERC National Championship in New Mexico in August. 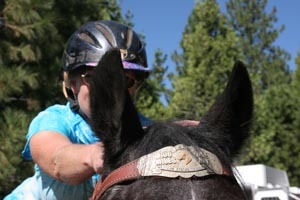 I thought they might just be going for a win at the Tevis this year, but Bev rode conservatively, and they finished in 26th. 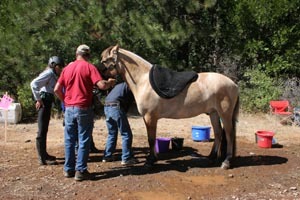 A horse getting shod while eating and resting at the first Foresthill vet check. Nick and his beloved Don. They finished 57th. Nick now has 5 buckles - but for Nick, it's not about him. It's about his horse. Don is his Heart Horse. "My long-range goal is for Don to get 10 buckles. Now that would be an accomplishment. 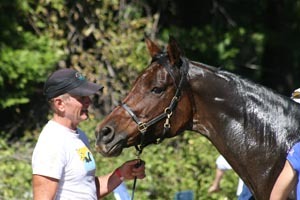 Not many horses have done that!" 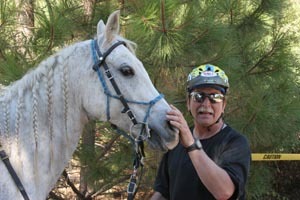 Don and Nick have now completed 3 Tevis rides together, and Nick's wife Judy rode him to a completion. Don is 4 for 4. He's got a lot of good years ahead of him. "When you have a horse like this, riding him is so much fun!" This horse already wears his own Tevis buckle! The Norwegian Fjord so many people were rooting for to finish! 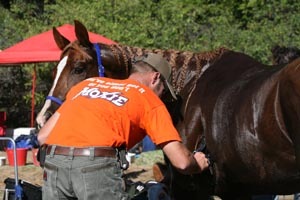 When Brandy Ferganchick and Fawn Creek Thor (aka Dodger) arrived at the finish line at 5:21 AM, it was announced that Dodger was the first Norwegian Fjord to ever complete the Tevis! 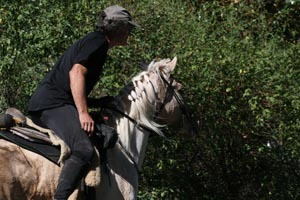 "Brandy took her time and did what it took to take care of her horse and get him through the ride," said one of her crew members from Colorado. Checking the pulse before entering the pulse box. An old friend from the past - Shelley Bridges! She got me started in (and addicted to) endurance in 1998. 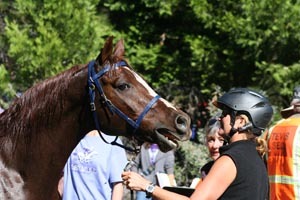 She rode a stallion, Xtreme Impact - who had something very important to say during his vet exam. Shelley and Impact got pulled at the Lower Quarry at 90 miles. Argh! Kevin Waters and DE Golden Ali going for their 3rd buckle together. They got it! Finished 19th at 10:12 PM. 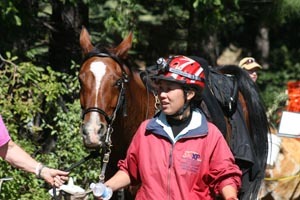 Japanese rider Hiromi Kitaike, going for her 2nd buckle with Fire Mt Odyssey (one of my old pals) - they finished again, at 3:11 AM! Odyssey is starving! Eating hay from owner Jackie Bumgardner's hands while walking to see the vets. These 2 men - Dr Gregg Fellers, Head Veterinarian, and Ride Director Chuck Stalley - had to be under a heckofalot of pressure - but they never showed it! 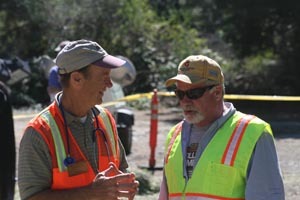 I think Chuck's motto is: when the going gets tough, tell a lot of great stories! Dennis Summers and OMR Tsunami - they had a several minute lead coming into Vet Check 1... but dropped a few minutes behind Jeremy and Rachel coming into Vet Check 2. 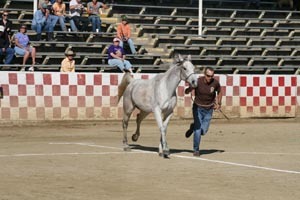 They ended up finishing 3rd - Dennis backed off because he didn't feel like pushing her on this day to try to catch the other two. Dennis loves his mare Lola. 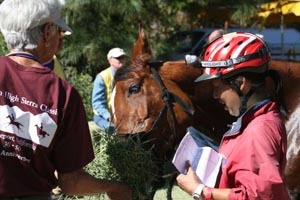 Haggin Cup - Best Condition - judging next morning for the Top Ten finishers. 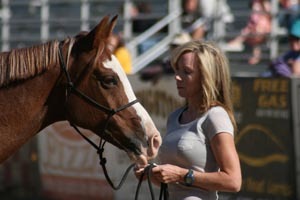 This is Heather Reynolds showing Riverwatch, with rider and husband Jeremy - they are Reynolds Racing - looking on. Jeremy and Riverwatch finished first with a ride time of 10 hours and 31 minutes. Riverwatch and Heather trotting out. 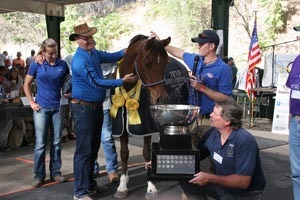 Riverwatch won the Haggin Cup! That's him up top receiving the award. The Fury (last year's Haggin Cup winner) and Garret Ford (5th place) trotting out. Well, The Fury is galloping. He's always full of himself and puts on a good show! Shellie Hatfield and Splashes Maskrade (Elmo). They finished 7th. Yes, 9th place finisher Laura Yost is not tall, and OT El Din RSI (El Din) is not short. They make a powerful pair! 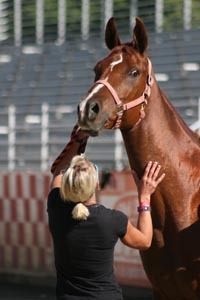 El Din is one from the line of Crockett Dumas' Outlaw Trail horses. 10th place horse Tallahassee (Tally, owned by Tom Christoph, is being shown by Shannon's dad Jay), ridden by Shannon Constanti. 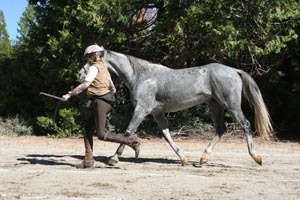 It's Shannon's second Top Ten Tevis finish in a row (last year was 2nd place on John Crandell's LR Bold Greyson). 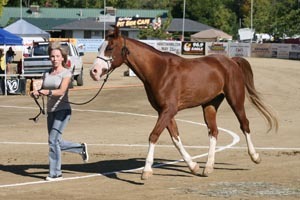 Tally is a National Show Horse - half Arabian, half American Saddlebred. Look at that long back! 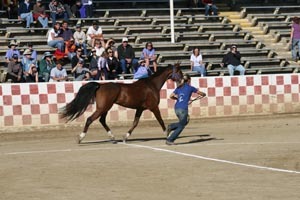 Look at that long stride! Shannon says Tally can be a bit... "challenging" to ride... but when he hits his 18 mph fast trot, he's smooth as silk to ride.